I found this interesting looking web in the alley next to my house (Amsterdam, NL) right next to the spot where I park my bike. Is it home to one of these (NSFarachnophobes) or could it be something else? I'm strangely fond of spiders and am curious to catch a glimpse of the beastie but I'd prefer to avoid being bitten. What's the kindest way to say hello to my new neighbour? Can I bring bugs as presents? Or should I leave well alone? I've also noticed in the past that a good summer for spiders is a bad year for mosquitos. 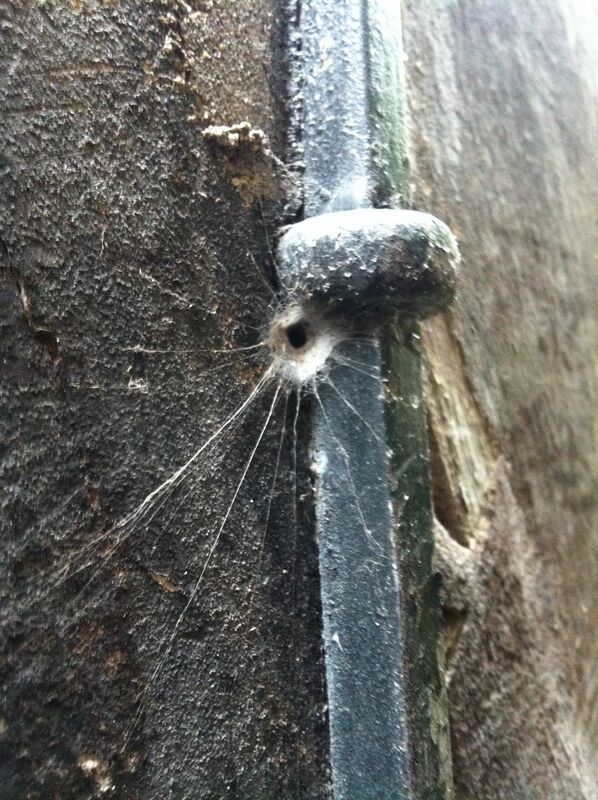 Is it possible to encourage the spider population around (outside) the house with respect to their seasonal life cycle? What are the risks of this, if any? I have lured many a spider out of its hidey hole by delicately tickling its web with the point of a blade of grass, or dropping a live ant onto the web (poor ant). Caveat: I am not experienced with venomous spiders.... maybe wear gloves, long sleeves, covered toes, and eyeglasses? I have done the same technique of tickling a black widow's web, and it was very satisfying to see the spider rush out for the bait. I have a hard time imagining any spider would do anything other than touch the bait, discover it's not a bug, and then run back into its hidey hole for dear life. Probably spidey would become shy and not fall for this trick twice. Maybe Europe has some dangerous type of spider I don't know about, but I myself would tickle this web without giving it a second thought. Cover up like pseudostrabismus says if you're at all worried about it. I mean it could be but... it just isn't. Tickle the web with a blade of grass or drop on a bug as pseudostrabismus suggests and withdraw your hand. It is not going to leap out at you and kill you! Thanks all! Followed your instructions, gave the web a gentle tweak and our toothsome friend popped out to see what's what. Smaller and lighter in colour than expected, so probably male, possibly juvenile and maybe another segestria species? Them's some shiny fangs though. I'll bring a bug next time and try and get a better look. Still very curious to know if it's possible to cultivate a spider colony in the alleyway, so any thoughts on that would be appreciated.